Both of these craters look similar when their floors are in shadow as was the case when I viewed them. 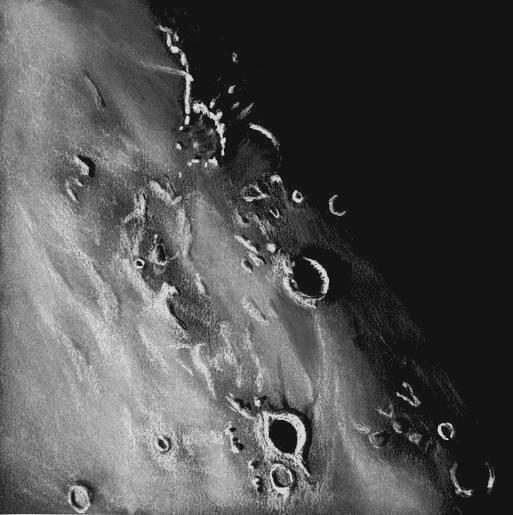 Lansberg (40 km) is a walled plain crater sitting where Mare Insularum meets south Imbrium. This old impact dates back to the Upper Imbrian and is near the center of my sketch. Reinhold (49 km) is a prominent lunar impact crater of the Eratosthenian period and is also on Mare Insularum. It is below Lansberg near the bottom center of the sketch which by direction is north as per the inverted Newtonian telescope view. At the top of the sketch (south) I was able to catch the Riphaeus Mountains receiving first light during this waxing gibbous phase. Wonderful sketch of this region. Your lunar sketches have such depth & the feeling of “being there”. Thank you for sharing them, they are always an inspiration. Whaw, Lovely sketch. I spend long minutes travelling through this moon landscape. Thank you all for the kind words of encouragement. Looking forward to your next posts here. i hope to see my last sketch of Clavius….. Thanks very much for submitting your excellent sketch of Clavius–we have indeed received it. Because of the number of sketches submitted by new contributors and regular contributors such as yourself, we can’t post everything from the regular contributors right away. In those cases, we typically allow about a month between postings so that everyone has an opportunity. Please be assured that your sketch of Clavius is fantastic, and we will definitely be posting it–but it may be another week or so before it is featured. Thanks again–to you and to all of our contributors–for all the sketches and please keep them coming!